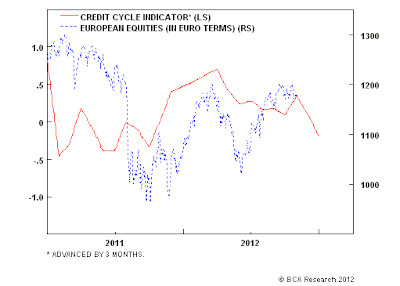 I have written in the past about how tail risk is diminishing in the eurozone. Another recent event occurred which further racheted down the probability of another black swan event. It’s also important to notice that the independent parties together are instead expected to obtain a clear majority. United, they could thus still approve a motion calling a referendum on independence. It would however be a completely unusual coalition centred on the conservative CiU and the leftist ERC. The Russian Black Sea Fleet in Athens? No, the wild card that I had been watching for is for Greece to turn to Russia instead of the Troika for financing. What if the Greeks got tired of the pain and turned to Putin for relief? Moscow has long had a historical desires for the warm waters of the Mediterranean for centuries. A financing deal could have shook up NATO and significantly shifted the geopolitical balance in the Eastern Med. Noble Energy Inc. said a field off the coast of Cyprus may hold as much as 8 trillion cubic feet of natural gas, the first discovery off the divided island nation. Results from the Cyprus A-1 well indicate from 5 to 8 trillion cubic feet of gas, with a gross mean of 7 trillion cubic feet, Houston-based Noble Energy said today in a statement. The field covers about 40 square miles (100 square kilometers) and requires additional appraisal drilling before development, the company said. This agreement has closed the door to a Russian financial rescue of Athens - and the ultimate black swan event of 2013. 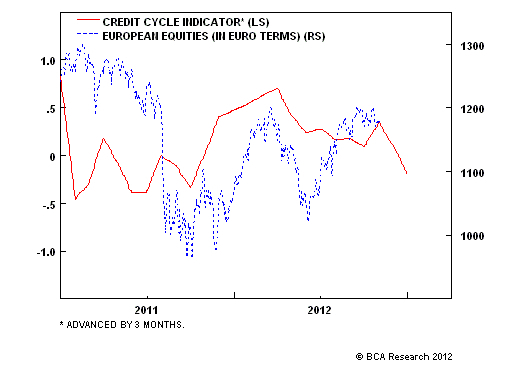 Tail risk in Europe just fell some more. Further to my last post (see Why China won't cause a commodity crash (yet)), I got a number of questions of what indicators I watch beside the Vancouver residential property market to see when the commodity supercycle is over. 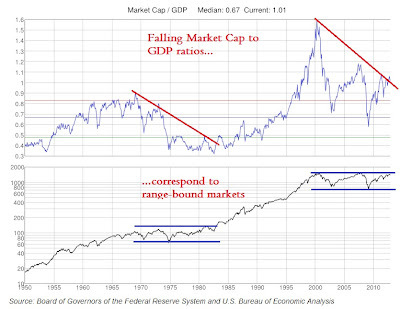 Chart of the Day latest chart showed a graph of the Dow/gold ratio. Watch for a reversal of that trend - then you'll know that paper is triumphant over hard assets (commodities). Edward Morse at Citi (via Business Insider) has made a bearish call on the commodity supercycle based on a slowing Chinese economy and re-balancing growth away from infrastructure spending toward the consumer. I beg to differ. The secular commodity bull cycle is not ending this cycle, but in the next downturn. Apart from Li [i.e. Li Keqiang, the new premier], the Standing Committee looks reactionary. The No. 3 leader is a North Korea-trained economist, Zhang Dejiang. Zhang will almost certainly represent the interests of state enterprises in future deliberations. The member slated to get the economics portfolio is the last-ranked Zhang Gaoli, another defender of vested interests. He is expected to block any reform initiatives that Li Keqiang may hatch. I wrote about this before (see China beyond the hard/soft landing debate). China has become, in the words of John Hempton, a kleptocracy. The boom was maintained through the financial repression of the household sector and the composition of the latest Poliburo suggests that financial repression, which has enriched many Party insiders, will continue. The other key lesson from Singapore is that single-party rule has retained popular legitimacy by delivering inclusive growth and equality of opportunity in a multi-ethnic society, and by eliminating corruption of all kinds, including cronyism and excessive influence for vested interests. What Singapore’s founder, Lee Kwan Yew, and his colleagues and successors understood is that the combination of single-party rule and corruption is toxic. If you want the benefits of the former, you cannot allow the latter. “Although there is no good corruption,” Wedeman writes, “there is clearly bad and worse corruption: the corruption that has negative effects, and the corruption that can have potentially catastrophic effects.” The science of kleptocracy separates the behavior into two basic types: “developmental corruption” of the kind we see in Korea and Taiwan, which does not ultimately prevent the economy from recovering, and “degenerative corruption” of the kind that ruined the economies in Zaire and Haiti. China is different because the Communist Party does not depend on injections of cash from the private sector. As a result, whereas dirty money was an integral part of the developmental success in South Korea, Taiwan, and Japan, in China corruption fits the classic definition — the misuse of public authority for private gain. In the long run, this type of corruption creates an incredible drag on an economy. It will eventually slow growth and the commodity supercycle will crash. In the short run, the composition of the current leadership suggests that it will continue to try to stimulate through more of the same, such as infrastructure projects, in order to boost growth. This will mean that commodity demand will continue - for now. At some point in the future, the global economy will turn down. When that happens, the Chinese economy will experience a crash landing, i.e. negative GDP growth, rather than the crash landing (sub-par GDP growth) that investors fear. Despite the slowdown, the market continues to be over-priced on an absolute basis (see this comparison from Vancouver Condo Info of what you get for $2.5 million). As the Chinese economy stabilizes and its growth revives, I will be watching the Vancouver residential property market as a secondary indicator of China's economic health. This will have important implications the growth path of the global economy and for the commodity supercycle. 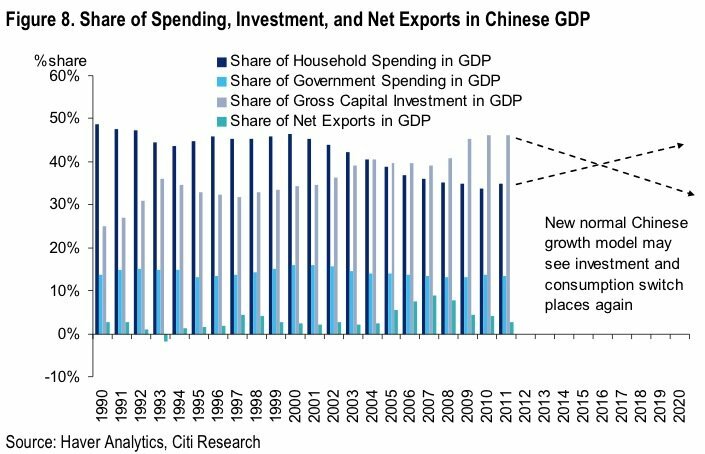 It should be obvious that China's economy has turned the corner. While we may not necessarily see gang buster growth, the risks of a hard landing are diminishing fast (see my previous posts China dodges a bullet? and Is the World Bank's downgrade of China's growth the nadir?). The chart below of Chinese stocks (as represented by FXI) compared to the MSCI All-Country World Index (ACWI) shows that FXI rallied through a relative downtrend line in October, indicating that the worst is over for Chinese stocks. Moreover, FXI has retreated to test the downtrend line, which is now relative support, and this represents a good entry point for China bulls. Given the volatility of Chinese stocks due to the uncertainty in political climate and weak corporate governance, a better way to play a rebound in Chinese growth may be through the markets of China's regional trading partners. The chart below of MSCI Pacific Ex-Japan (EPP) relative to ACWI shows that EPP is in a more robust relative uptrend. There is a short dated relative uptrend (dotted line) that began in October, which is supported by a longer dated relative uptrend (solid line) that began in May when EPP bottomed on a relative basis. Another way is to play a China rebound is through Australian equities, such as EWA. A glance at top 10 stocks in EPP shows that nine of them are Australian, which indicates that the Aussie market has the heaviest influence in EPP. Another way to get exposure is through the Hong Kong ETF (EWH). The chart of EWH vs. ACWI below shows that Hong Kong equities staged a relative breakout in late September and have been in a well=defined relative uptrend since. EWH does appear to be a tad overextended in the short-term, though. One way to diversify your exposure is to buy both Australia and Hong Kong. The bottom panel of the above chart shows the correlation between EWA and EWH, which currently stands at 0.62. While that is an elevated reading, keep in mind that is roughly the long-term correlation between stocks and bonds and therefore positions in those two ETFs should provide an adequate level of diversification while maintaining an exposure to the China bull story. [I]t may be premature to pile in on the short side. The market is oversold and it is poised for a bounce this week as option expiry weeks tend to have a positive bias and the SPX tests its 200-day moving average support. I was clearly wrong. Nevertheless, as the equity markets continue to deflate they have become even more oversold. 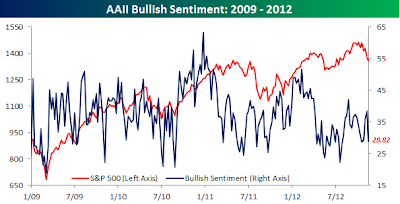 AAII bullish sentiment (via Bespoke) is falling fast. While the bears are in control of the tape, I would reiterate the risks of getting short at these levels. A curious bullish divergence is appearing in the currency markets. While stocks have continued their bearish pattern of strength in the morning and fading for the rest of the day, risk-on currencies such as the euro (shown in red) and the Canadian Dollar (blue) are showing strength. Similarly, commodity prices, which is another risk-on asset, have begun to steady. While the bears appear to be in control of the tape right now, I would reiterate my caution to get short at current levels. If you want to get bearish, at least wait for the rally to enter your position. Here is what I am watching. The graph below of the relative performance of SPY, representing equities and the risk-on trade, against TLT, representing long Treasuries and the risk-off trade, is forming a wedge - a sign of indecision for technicians. Technicians often describe this pattern as a coiled spring. When it breaks out, it will typically break hard in the direction of the break. The encouraging news for bulls is that the VIX has still not advanced above the level that is defined as 50% above its calendar year low (13.30 in August). This would suggest that volatility buyers view portfolio insurance as too expensive at current levels. In turn, this could have a calming effect on the broader market, as the mechanics of portfolio insurance purchases are a coincidental capping mechanism. In fact, a bullish unwinding of speculative downside bets or hedges against a decline is now a possibility, with expiration of index and ETF options this coming Friday and the high-demand VIX options set to expire on Nov. 21. There are too many things that could still go right globally, which could spark a rally that could rip the face off any shorts. The bear case is easy to make under the circumstances. The morphine jolt from QE-infinity is wearing off and the patient needs ever increasing doses of QE to power the market higher. The fiscal cliff looms and the consequences are dire. I understand this is considered political dynamite in Europe, but I still think it will be virtually impossible to fix Greece without a direct transfer of resources. A large, official debt forgiveness program. I suspect the alternative - a failed state on Europe's borders - will be more costly in the long-run. 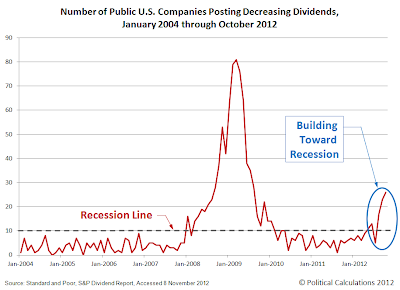 First, let us discuss the Cliff that no one else seems to want to acknowledge - The Earnings Cliff! 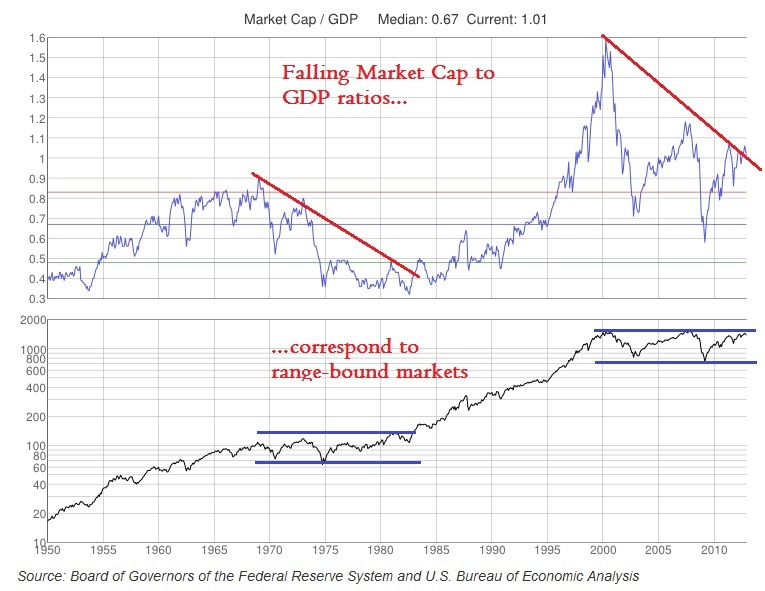 This is a very real phenomenon that is very dangerous for both stocks and the economy as a whole - corporations facing a deceleration in earnings growth or an outright drop in year-over-year profits DO NOT INCREASE SPENDING AND HIRING. They just don't. That is why earnings recessions make for a pretty good economic indicator, we can argue about whether it is a leading or a coincident indicator some other time. And please keep in mind that earnings and interest rates are the only thing that matter in the weighing (not the voting) over the long term. So, I'll spot you that interest rates are on our side - fine. And then you'll say, "but Josh, we're coming off of a record year for S&P 500 earnings!" And I'll agree, but then I'll remind you that this is not such a great thing. In terms of future recession probabilities, I now place us at 60% over the next 18 months. 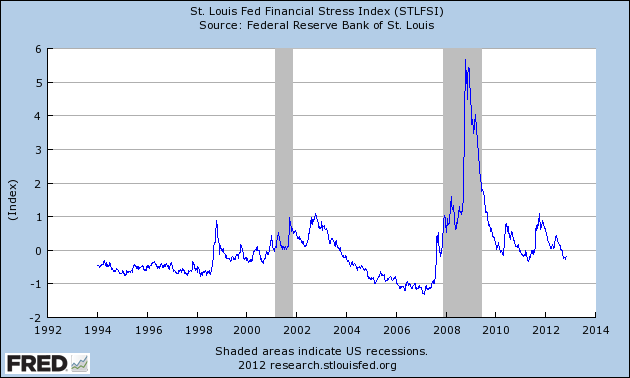 In other words, we are more likely to see a normal cyclical recession before Spring 2014 than not. Despite last week's negative market tone, I think that it's too early to get overly bearish. I interpret these signals as indications to be more concerned and the stock market will go sideways, but in a highly choppy fashion. -Totally junk the scheduled spending cuts for the military. -Do away with all of the mandatory non-defense cuts (sequestration). -Don’t do anything with taxes. Roll over everything for a couple of more years. -Extend the 2% payroll tax break for two years. If we kick the can down the road for a few more years, what do we get? The deep thinkers have come up with numbers that look pretty attractive. The CBO thinks that significant benefits could be realized as soon as September 30, 2013. In terms of jobs, the CBO reckons that as many as 3.4m jobs could be created/saved if everything on the cliff is pushed off to the future. The economy would be much stronger if the can is kicked. 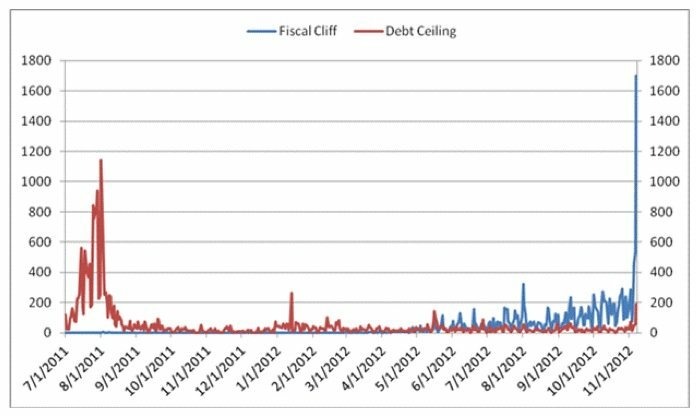 The difference between falling off the cliff and extending everything is 2.9% of GDP. That’s a very big number; it comes to $500Bn of top-line growth. 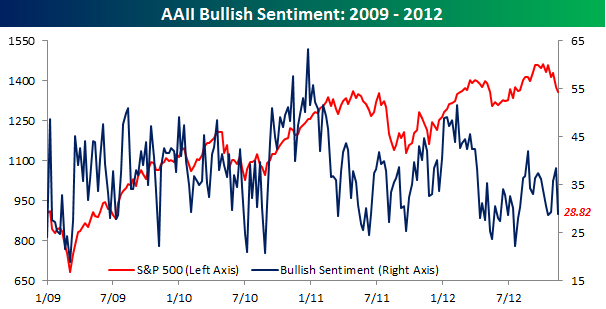 A political solution to the fiscal cliff would spark the face-ripping rally if you get bearish and short. 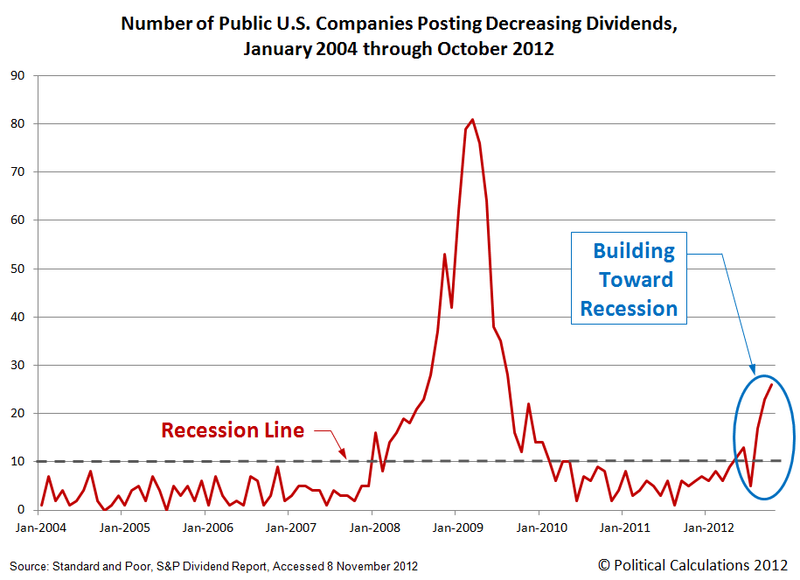 If we don't get a recession, what about an earnings recession that send stock prices down? I have written about the bifurcation in the US economy (see Time to take some risk off the table). Employment, consumer spending and housing have been headed up, but business confidence and capital spending are tanking. Could labor's share of the economic pie be coming back and the returns to capital shrink? If so, stock prices would react to a margin squeeze like that by falling. 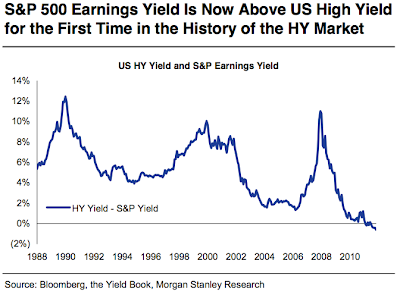 Brown and Ritholz referred to this as an earnings cliff. Clearly, there have been some high-profile earnings misses this quarter, such as Google and Apple – and of course there is the fact that Google even mistakenly released their earnings report midway through the trading day on Oct 18 vice after the close of trading. Despite this, as we look at the numbers, we see a current earnings season that looks, at least statistically, very similar to the last and also compares very closely with long-term averages. I am no Pollyanna who believes that everything is fine and this is a buying opportunity. I just think that the bearish case is over-hyped and we are not going straight down from here. I am particularly concerned about the signals from the commodity markets. Despite China's apparent turnaround in growth, why are commodity prices turning down? The signal from this market tells me that global growth is slowing. 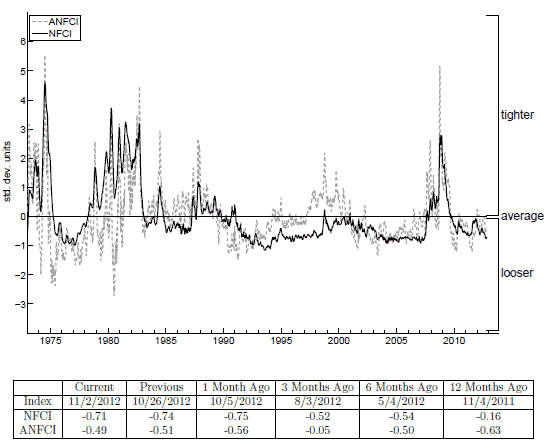 The Chicago Fed's National Financial Conditions Index isn't telling me that I should panic either. Watch these indicators. 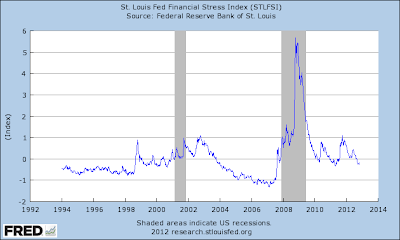 Should financial stress start to spike, then it will be time to get bearish. I don’t imagine we go straight down from here; There will be sell offs and rallies, pre and post elections. There will be some data points that suggest things aren’t so bad, and then some that are awful. It is not a black and white situation. I do believe the low volatility we have seen may very well become a thing of the past, and the VIX is becoming a definitive Buy. It's looks like the market is going to be choppy for a while. While AAPL's stock price has been deflating lately, talk that it is losing its competitive edge may be premature. To double down and then bet on the Blackberry 10 is like putting your money down on a long-shot exacta at the track - a risky proposition. To be sure, this pair trade has shown a positive reversal and it does show recent positive momentum in favor of RIMM. The pair has been in a long relative downtrend as AAPL has outperformed RIMM for over five years. If you were to look at this chart, how confident are you further upside? I suggested to my colleague that a better risk-controlled pair trade would be to buy RIMM and sell NOK. Both are perceived to be failing brands among wireless device makers, though RIMM is exhibiting positive momentum. The pair is in a relative uptrend in RIMM's favor and there is more potential upside. Warning: This is not a high conviction idea for me, but if someone wanted to speculate on the Blackberry 10, this is probably a better and more risk-controlled way to make that bet. The market has been on a wild ride overnight since the election. It seemed as if Mr. Market couldn't decide if another four years of the Obama Administration was good or bad. Initially, ES futures sold off hard as the polls closed and Obama gained ground on Romney. It then rallied soon after Obama was declared the victor and the USD weakened against most currencies. Most Asian and European bourses rose overnight. As the markets are poised to open on Wednesday, ES futures are deeply in the red and the USD has regained a bid. Watch and listen to the message of the market. Ezra Klein has an (unscientific) sample of pundits with their views of the electoral outcome for the Presidential election and there are 11 calls for an Obama victory and 8 calls for a Romney victory. My favorite forecaster is intrade. Notwithstanding the argument that polls are where people voice their opinions and prediction markets are where people put their money on the line, I was convinced of the prediction markets when in 1980, the polls showed a neck-and-neck race between Reagan and Carter, while the betting books in London showed about a two-thirds chance of a Reagan win. The rest is history. Here is my thought of the day. With opinions so divided and assuming that intrade forecast is correct, how badly will the markets be "surprised" by an Obama win? This blog has always been an advocate of using human intelligence as oversight over quantitative investment systems. In particular, I have been concerned about the takeover of trading the HFT robots. In the 67 years since the detonation of the world's first nuclear weapon there is only one time the so-called nuclear briefcases were broken out and opened up. On January 25, 1995 they not only opened, they nearly launched Russia's nuclear arsenal at the United States. Now consider what might have happened if algorithms were in charge? The missile signature looked like it was carrying a multiple warhead. What if the algos had decided that it was a hostile launch. What would it have done? This a cautionary tale for HFT algo designers, who claim that their systems have numerous safeguards. Safeguards can and do fail. We found how an unexpected perturbation during the flash crash created enormous systemic problems. Fortunately, the only thing that people lost during the flash crash was money. If algos had been in charge of the Soviet defense system in 1995, we all could have lost our lives. It is a well known fact that homeownership in the US has been on a decline, a trend that started even before the financial crisis. Now Moody’s predicts this trend will begin reversing next year. Their explanation has to do with demographics. Baby boomers are moving into the highest homeownership group by age, while “echo boomers” (children of baby boomers) are getting to the age at which they are significantly more likely to own a home than the younger age group. 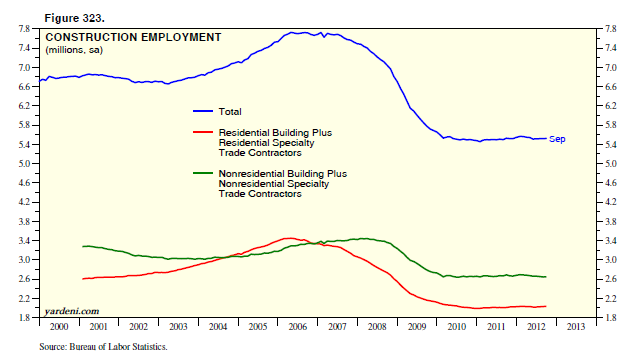 What's more, last Friday's NFP report showed that the construction sector showed healthy employment gains. Despite being only 4.1% of the workforce, the sector showed 9.1% of the gains of 171K jobs. Should construction continue to recover, then it would indeed be good news for the US economy and has the potential to feed through into a virtuous cycle of better employment and higher consumer spending. So what's next for the investors in homebuilding stocks? In the short term, there could be some turbulence. Despite what some of the polls say, the latest figures from intrade.com shows Obama solidly in the lead for the big showdown on Tuesday. If Obama were to win re-election, which is my base case scenario, then you can expect that capital gains tax rates will rise. In response, expect investors to harvest their capital gains this year instead of waiting to take them next year and get hit with a higher tax bill. What stocks have had the most gains this year? You guessed it, it's the homebuilders. Therefore, in the near term, don't be surprised to see some softness in these stocks as investors take their capital gains in 2012. Longer term, the technical picture looks promising. The relative performance chart below of XHB against SPY shows that the homebuilding ETF to be in a well-defined relative uptrend (red channel) but testing a relative resistance level that dates back to 2007. A breakout out of such a long base suggest a technical target that is well above the relative highs set before the Lehman Crisis of 2007. Should tax-related profit taking occur, don't be surprised if these stocks pull back and test the bottom of the relative uptrend. Bottom line: Short-term cautious, but long-term bullish on the sector. Expect some weakness until year-end, but any weakness could be a great opportunity to buy. Cam Hui is a portfolio manager at Qwest Investment Fund Management Ltd. ("Qwest"). This article is prepared by Mr. Hui as an outside business activity. As such, Qwest does not review or approve materials presented herein. The opinions and any recommendations expressed in this blog are those of the author and do not reflect the opinions or recommendations of Qwest. None of the information or opinions expressed in this blog constitutes a solicitation for the purchase or sale of any security or other instrument. Nothing in this article constitutes investment advice and any recommendations that may be contained herein have not been based upon a consideration of the investment objectives, financial situation or particular needs of any specific recipient. Any purchase or sale activity in any securities or other instrument should be based upon your own analysis and conclusions. Past performance is not indicative of future results. Either Qwest or Mr. Hui may hold or control long or short positions in the securities or instruments mentioned.